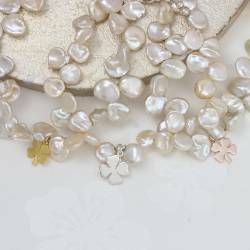 The depth of colour and lustre on the pearls make this a very special necklace. As the pearls are top drilled they are fluid and move as she does and beautifully catch the light. These pearls shimmer with iridescent pinks and blues which look absolutely stunning. You can choose to have the clasp in sterling silver, rose gold or gold plated. All have an extension chain so she can get the perfect length. Your necklace will be beautifully gift wrapped in a matt black box, tied with ivory satin ribbon and a gift card enclosed. This standard service is completely free of charge. We do now offer a luxury gift wrap service. Orders can be wrapped in luxury black and gold paper and finished with a black satin bow and gift card, or silver paper finished with lilac satin ribbon and silver gift card. There is a small charge per item for this service.